Benjamin Evett in "Bakelite Masterpiece"
“Consider Lucifer” is a suggestion made by the major character in the brief play The Bakelite Masterpiece by Kate Cayley, which premiered in Toronto in 2014, was then co-produced by the Berkshire Theater Group and WAM in 2016, and is now being presented by New Rep in Watertown. Based on events concerning the infamous Dutch forger Han van Meegeren, it's a spare two-hander co-starring Benjamin Evett as Meegeren and Laura Latreille as the (fictional) character Geert Piller, an art historian who has been handed the task of determining the guilt or innocence of the painter accused of Nazi sympathies. Specifically, the forger is accused of selling a painting to Goering, ostensibly created by Vermeer; his defense will be that he in fact defrauded the Nazi with his own forgery and thus should instead be considered a hero. The title refers to his ingenious use of a bakelite spread brushed on the painting before baking it to simulate its aging process. Bakelite, an early plastic, was formed from the combination of phenol and formaldehyde, (the chemical name for which is polyoxybenzylmethyleneglycolanhydride, for short). All the action takes place in his prison cell in Amsterdam in 1946, as he proposes to prove his skills by creating a copy of a Vermeer that depicts Christ and a woman caught in adultery, using Piller as his model. As proposterous as this plot point seems, (and it does in fact become a difficult concept to accept even as some of Piller's issues are gradually revealed), playwright Cayley has fashioned an engrossing conversation and confrontation. Laura Latreille & Benjamin Evett in "Bakelite Masterpiece"
Evett and Latreille (the latter seemingly battling a cold) were tremendous foils for one another. 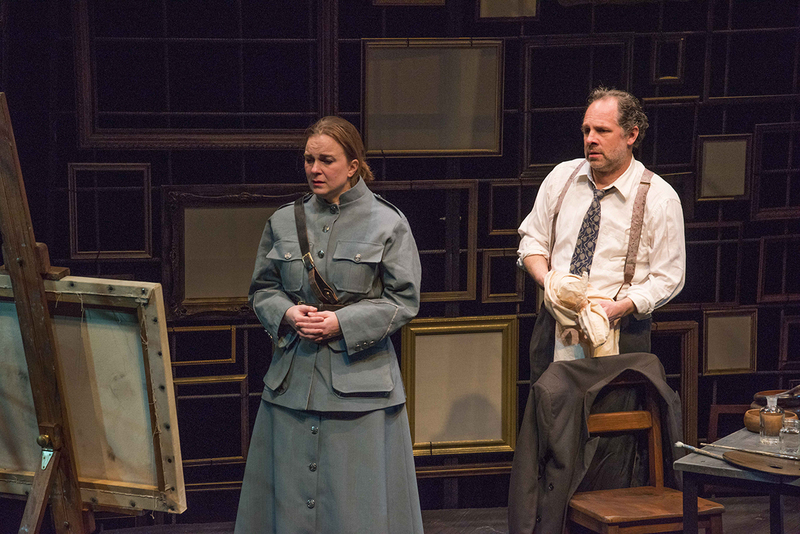 While the rhetoric sometimes bordered on the hyperbolic, they maintained their characters throughout the intermissionless, ninety-minute work, under the focused direction of Jim Petosa, the company's Artistic Director. Evett, in the showier role, displayed his familiar no-holes-barred delivery, in one of the most powerful roles of his estimable career, at times literally throwing himself into the fray. All of the technical elements contribute to the feeling of being hemmed in by history. 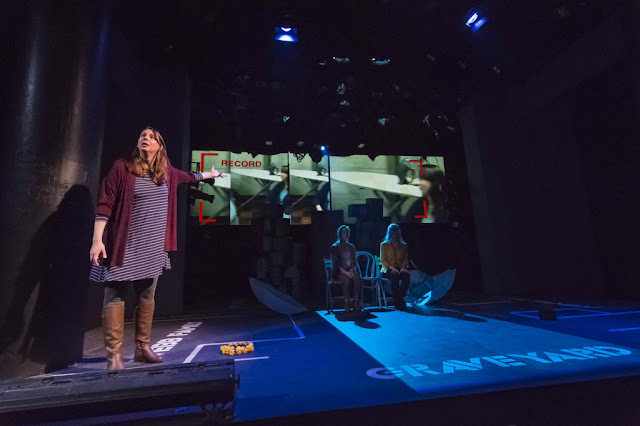 The Set Design is by Christina Todesco, with Lighting Design by Scott Pinkney, Costume Design by Molly Trainer and Sound Design and Original Musical Composition by Dewey Dellay, each helping to forge belief in the incredible plot premise. The painter/forger's urging to “consider Lucifer” (the angel who disobeyed and thus was thrown out of heaven and into hell) questions whether truth demands some doubt and whether being a “perfect fraud” is worse than a complete fool. He also alludes to the fact that the New Testament evangelists who wrote the Biblical story never revealed exactly what Christ wrote in the sand that effectively prohibited the crowd from stoning the woman; tradition maintains that it was an allusion to the sins of those all too ready to pick up the stone. And he further questions whether sometimes hate can be useful, as well as if forgiveness is always deserved. For those eager for irony, let them consider the program note that Meegeren's “original” forgeries have been replicated by still later forgers, including his own son. “Consider Lucifer” indeed. Let she or he who is without guilt (including critics) throw the first stone, through April 8th. Jonathan Lewis Dent, Toccarra Cash, Patricia R. Floyd & Maurice E. Parent in "Skeleton Crew"
At a time like the present, with so many articulate high school students reminding us all of the innate power we have at the ballot box, Huntington Theatre Company is presenting the Boston area premiere of Skeleton Crew by Dominique Morisseau. Though set in a Detroit stamping plant “somewhere around the year 2008”, it's a timely reminder of how national policies and events impact the everyday lives and livelihoods of real people up and down the political food chain. 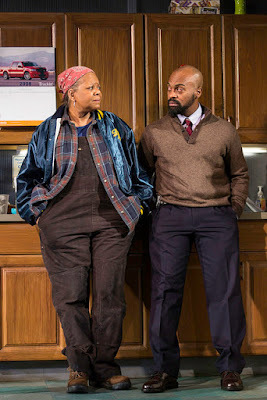 In her trilogy entitled Detroit Projects, which she admits is modeled after August Wilson's Century Cycle, the playwright questions, how did we go from a city of people who make cars to a city of people living in their cars? In Detroit '67, she wrote first about that city's 1967 riot and consequent police brutality, and in Paradise Blue she focused on a 1949 housing renewal act and aggressive gentrification. In Skeleton Crew (an apt title on several levels) the action takes place entirely in the break room of the city's last small auto plant still standing, which she describes as an “existential breakroom, a false space in a way, but a false space within a very real place”. In a very real sense, the room is a metaphor for where the author's characters find themselves, as rumors of the plant's closing swirl around them. The Scenic Design by Wilson Chin serves as a fifth character in its meticulous attention to detail, from the ubiquitous hand-written signs (such as “No smoking FAYE” or an upcoming Unit Meeting of union members), refrigerator, microwave, coffee maker, boom box, Mustang poster, time clock with punch cards, unisex bathroom and two bulletin boards. Behind these down-to-earth mundane elements there are some secrets (not to be revealed here) that all of the playwright's characters are hiding, not the least of which is how each confronts the primary issue of ethics vs. self-preservation, with survival foremost in their minds. 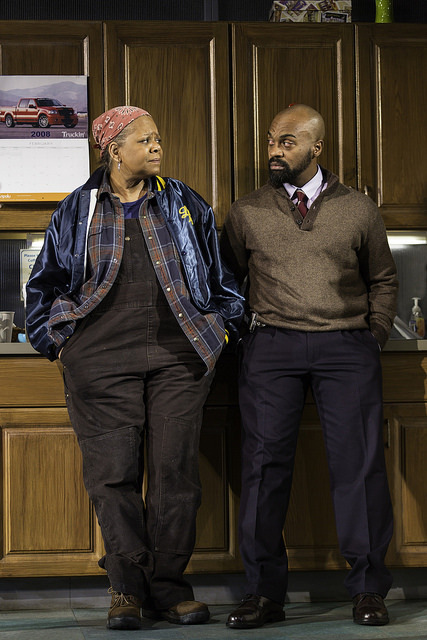 Patricia R. Floyd & Maurice E. Parent in "Skeleton Crew"
Faye (Patricia R. Floyd), a quintessential survivor with twenty-nine years on the factory assembly line, is fully aware that “any moment one of us could be the other”. Dez (Jonathan Louis Dent) dreams of life beyond the factory, hoping to open his own garage. Shanita (Toccarra Cash) a very pregnant mom-to-be, is a hard-working second generation assembly line worker, saving up enough to support her first child. And then there is Reggie (Maurice Emmanuel Parent), a graduate from the line who has been made a factory foreman, a promotion that makes him torn between his obligation to his fellow workers and management. How each of these makes concessions in the name of “success” makes for a tightly woven narrative, with Morisseau sometimes tantalizingly withholding information that this fine cast, wonderfully Directed by Megan Sandberg-Zakian, convey through nuances, unfinished thoughts and finely tuned gestures. Floyd is the perfect yet atypical matriarchal figure; Dent is a dreamer whose fantasies just might come true; Cash is a pluperfect timely deliverer of snappy dialogue. But it's Parent who provides the dramatic heft with his complex portrayal of the well-meaning middle man stuck in the middle of a dilemma. The other creative elements, from the apt Costume Design by Ari Fulton, to the intricate Lighting Design by Adam Honore, to the menacing Sound Design by Nathan Leigh, all contribute to this production's realistic feel and impact. As Parent's character of Reggie puts it near the end of the play, he's running purely on “soul”. Each of the foursome in her or his own way finds a way to cope with realities seemingly beyond their individual control. There are no bones about it: as the playwright puts it (and as those teens in the headlines might echo), it's time, or perhaps even past time, to “rise the hell up”. New Rep's "Ripe Frenzy": Topical Paradise? 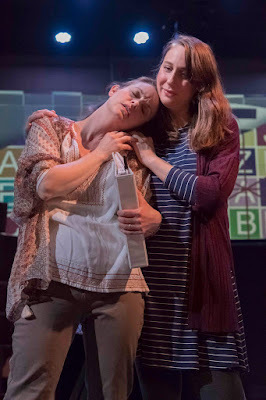 Veronika Duerr, Stacy Fischer & Samantha Richert in "Ripe Frenzy"
As one approached the venue for the play Ripe Frenzy by Jennifer Barclay, one was greeted by a series of theater posters on the walls of prior productions of Thornton Wilder's Our Town. Then one was handed a program with the phrase “striking topical drama” on its cover, and inside a note by Director Bridget Kathleen O'Leary referencing the shootings at Columbine and other schools. With regard to the setting, the program noted that the action was to take place in the town of Tavistown, New York in 2017, at the high school theater and the surrounding woods. One was tantalized by the ambiguously portentous admonition that “time is slippery here”. And indeed it was to be. We were certainly not in Kansas, Toto. 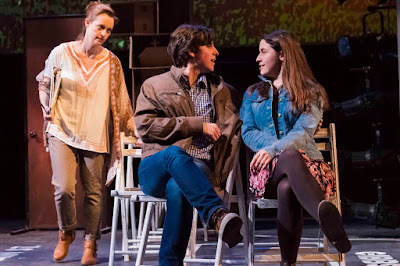 This latest choice as the National New Play Network Rolling World Premiere, a co-production by New Rep Theatre and the Boston Center for American Performance, was beginning to feel more than a bit threatening and not about a small town paradise it may have first seemed. Stacy Fischer, Henry B. Gardner & Reilly Anspaugh in "Ripe Frenzy"
Produced at Boston University's Studio ONE (from February 24th to March 11th), in an intermission-less fast-paced ninety minutes, this was a stunner from the first appearance of the main character Zoe (Veronika Duerr), as we were informed by her that she played the role of The Stage Manager decades ago in one of the school's biennial productions of “Our Town”, and she is now, among other things, (such as town historian), the real life stage manager of the fortieth production of the work (which she mysteriously refers to as the thirty-ninth-and-two-thirds production, which is the heaviest hint of what's to come); she is also mother of the show's projectionist. The director of this version of “Our Town” is Miriam (Stacy Fischer), also a mother, and helping out is another mother, Felicia (Samantha Richert). There are also teenagers, Matt (Henry B. Gardner), Bethany (Reilly Anspaugh), Hadley (also played by Anspaugh) and Bryan James McNamara (also played by Gardner). 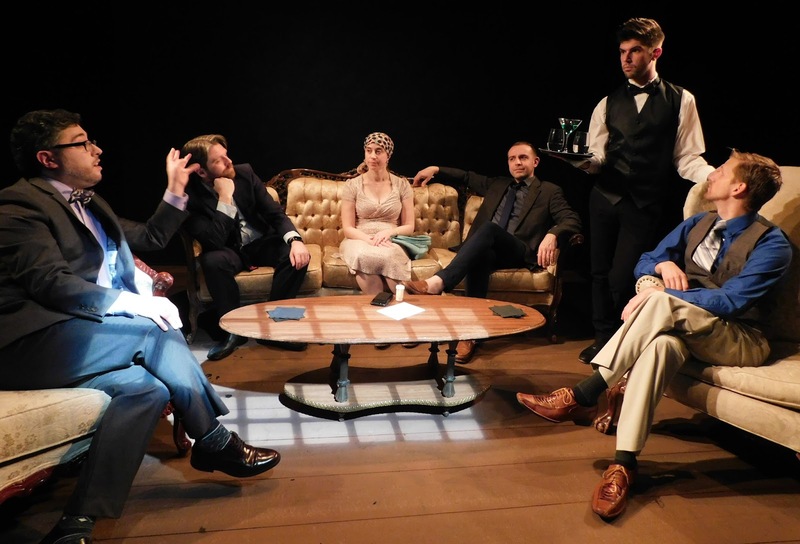 Under O'Leary's taut direction, the cast, without exception, was stellar, most notably Duerr (who impressed earlier this season in SpeakEasy Stage's Men in Boats). Her opening lengthy monologue as Zoe was a true acting tour de force. The creative elements were also on point, from the Scenic Design by Afsoon Pajoufar, to the Sound Design by David Reiffel, the Costume Design by Annalynn Luu, and most especially the work of Projections Designer Jared Mezzocchi, who described his contribution as “mediaturgy” (the importance of which might even be a spoiler). Stacy Fischer & Veronika Duerr in "Ripe Frenzy"
As the plot developed, we became more aware of what Zoe meant when she noted that “logic is calming” and that “positivity is a choice we make”; so is denial, expressed by her: “we must remind ourselves of the goodness in life”, and the fact that two seemingly opposite things can both be true. Love and horror co-exist. Ripe Frenzy is a much darker (and maybe more truthful) take on small town life than that of Wilder. To elaborate on these themes would be to give in to the temptation to clarify some issues that would be unfair spoilers. Many people have relatively benign and romanticized remembrances of Wilder's original, conveniently forgetting how even he had his bittersweet moments. In his preface to the published version of his work, he spoke of how theatergoers were beginning to seek plays that were “soothing”; while he sought to demonstrate “a value above all price for the smallest events in our daily life”, he at the same time utilized the words “hundreds', “thousands” and “millions” many times, to assert that individuality is inner; it lies within. It's the obverse of what Playwright Barclay clearly sees, the town from the other side of the tracks. Were Barclay to portray the character of Emily, she would still have her bemoaning as to how one never notices another in a cloud of ignorance and blindness. This Our Town has morphed into the current reality of what might now be entitled Every Town. Mikey DiLoreto, Alex Jacobs, Jenny Reagan, Victor Shopov, Adam Boisselle & Mike Nilsson in "Steve"
Steve, by playwright Mark Gerrard, the current production by Zeitgeist Theatre, is first and foremost a play for all musical comedy queens with its myriad list of showtune references, but should appeal to any even broader spectrum of theatergoers. Stephen (Alex Jacobs), a somewhat inhibited businessman and Steve (Victor Shopov), failed chorus boy and stay-at-home dad raising their son, have been live-in partners for sixteen years. Their small circle of friends includes lesbian Carrie (Jenny Reagan), recently broken up with her longtime girlfriend (and terminally ill). There's also a hunky personal trainer named Steve (! ), whom we mercifully don't see, and a flirty Argentinian waiter/dancer Esteban, which is Spanish for, um, Steve (Adam Boisselle). Another Steve (this one named Sondheim) in one version of his musical Company had a line about “multitudes of Amys”; this show obviously has a multitude of Steves. Oh, and there are guys not named Steve, Brian (Mike Nilsson) and Matt (Mikey DeLoreto). Issues that arise in these relationships include narcissism, sexting, monogamy, and middle aged gay New Yorkers and how they interact. Victor Shopov & Jenny Reagan in "Steve"
What they've come together to celebrate is the 42nd birthday of Steve, to the tune of a barrage of showtune references, at least a couple of dozen just in this first scene. Most of them are fairly current shows, though Call Me Madam and Oklahoma! get brief mention. Some are quick and easy to miss (a cat named Elphebah, for example, or a line like “you're not a kid anymore, you'll never be a kid anymore” from Company. One of the more enjoyable ways to approach this encyclopedia of references is to try to catch which shows are included while still trying to follow the really thin plot. For the record, these would include Mame, Merrily We Roll Along, Man of La Mancha, West Side Story, Into the Woods, Bye Bye Birdie, A Little Night Music, Jesus Christ Superstar, My Fair Lady, Sunday in the Park with George, South Pacific, A Funny Thing Happened on the Way to the Forum, DreamgirIs, and I Can Get It For You Wholesale. And, yes, they're all in that first scene. Alex Jacobs, Jenny Reagan & Mike Nilsson in "Steve"
Once the play gets a bit less referential, there emerge some truths not to be revealed here, but suffice it to say that, thanks to David Miller's terrific direction and the acting of the ensemble, especially Zeitgeist repeaters Shopov and DiLoreto, there is much to appreciate in the play itself. One problem is that,in addition to the confusion about which Steve is which in any given line, and the roles of five other unseen characters, Gerrard also tinkers here and there with time (clumsy flashbacks) and place (suddenly we're at Fire Island?). But there are enough moving moments (as when Reagan protests about her ex, “we speak every day...almost”) as playwright Gerrard pursues the serious side of the zeitgeist. At one point Reagan queries if their talk might be “just noise”, a provocative question for a playwright to pose. Zeitgeist may be off-off-Tremont, but it should be on every Boston theatergoer's map. It's never boring and is often more insightful than the product of a lot of other larger local companies. In any case, for members of this little company that could, it's obviously a labor of love, and it shows. 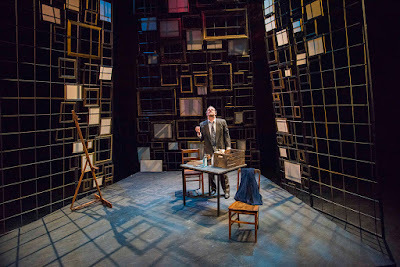 The Direction, Scenic Design and Production Photos are by David Miller, who rumor hath it also makes the popcorn (untrue), with Lighting Design by Michael Clark Wonson, Sound Design by Jay Mobley and Costume Design by Elizabeth Cole Sheehan. One caveat: if you're going to put on a show with choir style seating, an overstuffed wingback chair on stage makes for partially obstructed views for some audience members. Steve (all of them) is at the Boston Center for the Arts through March 24th. It's fun and a lot more engaging than a mere list of other theater pieces makes it sound. You should see it even if your name isn't Steve. Adrianne Krstansky in "Every Brilliant Thing"
Local actress Adrianne Krstansky, as the Narrator and sole performer in the play Every Brilliant Thing, now being presented by SpeakEasy Stage, has a little list, enumerating the things in life that make it worth living, as a means of communicating with her suicidally-inclined mother. It's a list that started as a defense mechanism in the eighth year of her character's life and grew, from simple material things to the more complex. 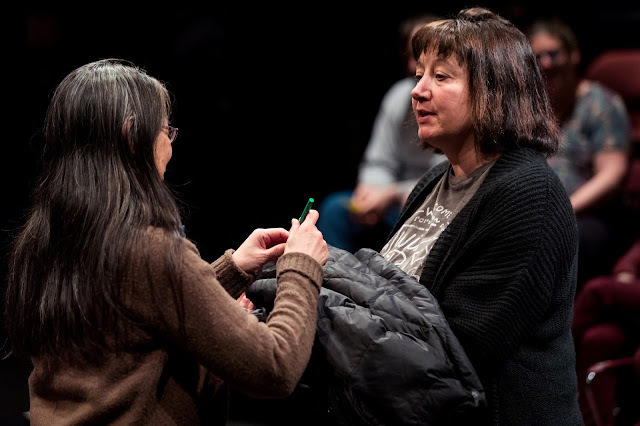 Members of the audience are employed to insert occasional (mostly pre-written) contributions that not only break the theatrical fourth wall but embrace it, while essentially demolishing it. As such, it offers, for better or for worse, an unusual degree of spontaneity and improvisation, which makes it clear that no performance of the work is the same as any other. This level of reality theater could be disastrous in many an actor's hands, but this is not just any actor, but in point of fact (wait for it) a truly brilliant thing herself. 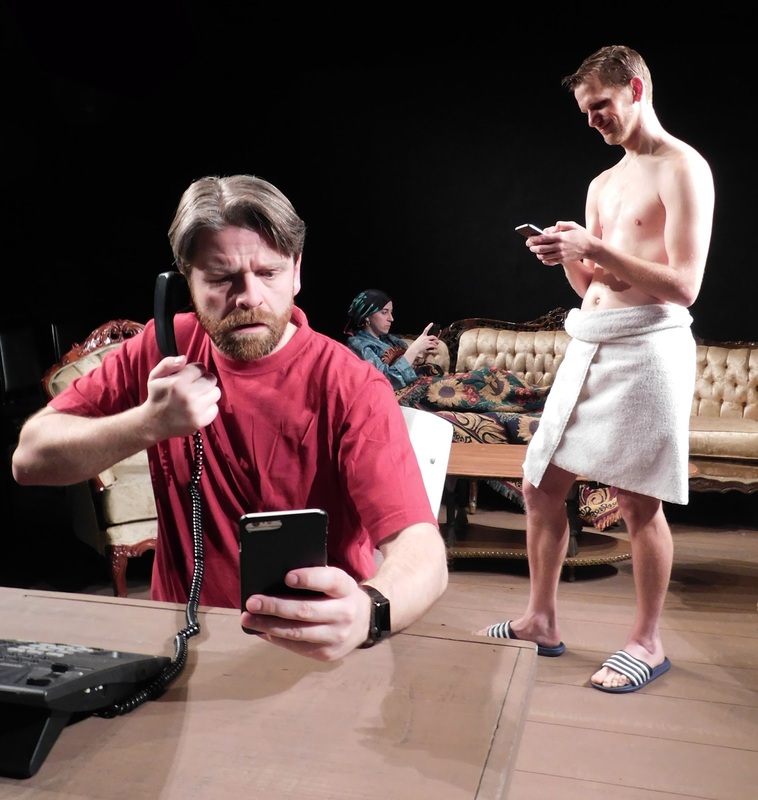 The play first saw light at a 2013 British fringe festival, written by Duncan MacMillan and stand-up comic Jonny Donahoe (who also performed it), eventually finding its way to these shores in 2014, off-Broadway. The fact that it is playable by any gender on the spectrum of life ably demonstrates its universality; on the other hand, it also betrays the fact that we don't have much opportunity to get to know this character. 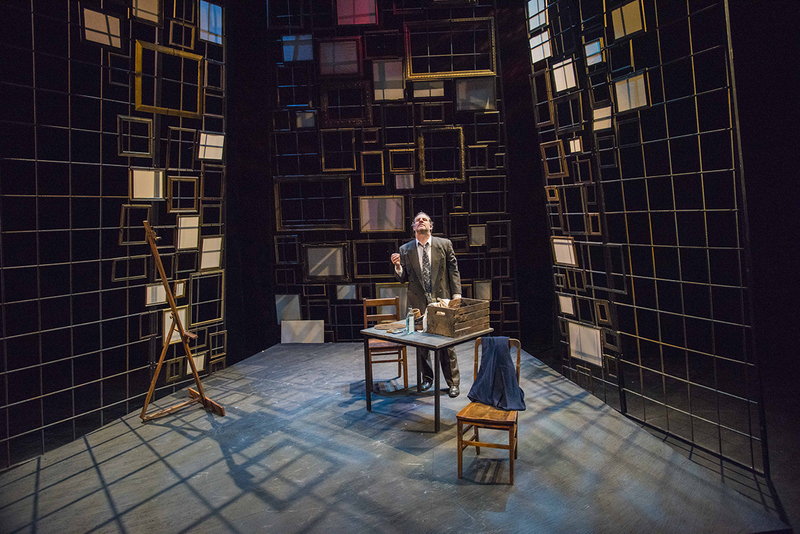 The company's Producing Artistic Director Paul Daigneault admits in the program notes that he's not a huge fan of one-person shows and thus has rarely presented them. One of the reasons he chose to do so in this instance has to have been the further choice to select as Director another renowned actor, Marianna Bassham. It's an enlightening window into what might be identified by the Narrator as the source of many moments of life's mysteries, joys and wonders. Imagination, she discovers, is fundamentally what makes life worth living. That all this is accomplished on a bare fully-lit (Lighting Design by Eric Levenson) “in the round” (well, square) stage with no set and few props to speak of, with the protagonist simply attired in gray and black with a Twin Peaks shirt (Costume Design by Amanda Ostrow Mason), is all the more astonishing; so is the abundance of wry humor. A few episodes are heart-breaking, bittersweet and funny all at the same time, as when the family pet, to be put to sleep, is revealed to have been named “Sherlock Bones”; it's a moment when her seven year old psyche learns the lesson that a loved one can become an object and thus may be taken away forever. There could have been more allusions to such loss or to her parents' reactions to her list (her mother never verbally acknowledging it, her father merely correcting her spelling), or of the briefly mentioned allusion to the “Werther effect”, from a Goethe novel, meaning a change or “copy cat” act brought about by interaction with a powerful artifact of pop culture, such as the suicide of a prominent figure like Marilyn Monroe or Robin Williams. That both Actor and Director succeed so well in their respective roles is a testament to their previous growth in theater, as well as their research into how parental depression leads to what the playwright defines as a cloud of silence (Sound Design by Lee Schuna) hovering over a family when they are coping with mental illness. They succeed in conveying the sadness, the guilt and the shame felt by those who love them, while at the same time amassing a list of brilliant things that would indeed be missed. There is a ironic lyric from the theme song of the television series Mash: “suicide is painless”. Not.